Very dense purple with vibrant, heartwarming fruit, real density of the palate, a little black fruit but more deep red, some acidity, crunchy minerals. Very well put together, a wine which should sing in the medium to long term. From the west-facing Le Charlemagne, the vines are planted on marl soil which gives an almost tannic, mineral structure to the wine. This has lovely fruit ripeness and lots of energy, culminating in a very chalky, pithy finish. The absence of new oak serves to preserve the freshness of the pristine fruit. Drink 2020-2027. 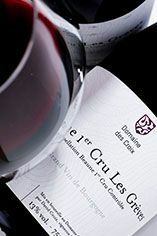 The former Domaine Duchet in Beaune was bought in 2005 by American Roger Forbes and his co-investors, and entrusted to the care of David Croix, the gifted winemaker for Camille Giroud. 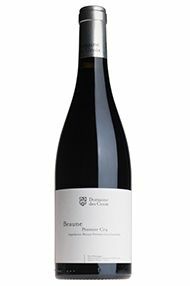 The estate has been renamed Domaine des Croix, in honour of David and also the numerous stone crosses to be found in the vineyards. The original Beaune and Corton-Charlemagne vineyards have since been supplemented by Aloxe-Corton, Corton La Vigne au Saint and Corton Grèves. The vineyards are farmed organically. The only thing David Croix doesn’t like in 2016 is the lack of volume. He was full of praise for the quality of the vintage, explaining that the grapes were very healthy at harvest despite the difficult season, and said the aromas in the winery during fermentation were glorious. 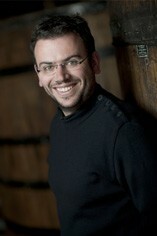 He describes the wines as “harmonious, with nothing that is out of balance”. 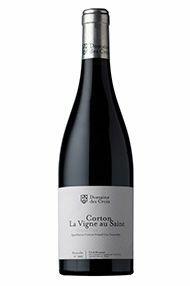 No Bourgogne was made this year, there are tiny volumes of village wines and several of the Beaune Premiers Crus have been blended to make a single wine. In fact, only Corton-Charlemagne has achieved anything like a normal yield. Made using 50 percent whole-bunch fermentation and healthy fruit this has a lovely crystal-clear purple colour with a beautiful fragrance. With dense fruit on the cusp of red and black, there’s more short-term tannins from the stems but these will integrate beautifully with the fruit. This will have a great future. David Croix started picking here on 11th September, two days before he began at Camille Giroud. This was a much easier harvest than 2013, as there was much less hail than the previous vintage. The wines have an elegance and freshness to them that appeals enormously, and yet does not hide their impressive concentration. Bright intense purple, this is also extraordinarily intense on the palate, with vibrant black fruit almost bramble jelly, yet high acidity to maintain the necessary freshness. It should come together nicely in the medium term. Less hail here and better flowering from younger vines. Lovely classy pinot to this, fine and elegant, good acid balance, lovely finish to it, stylish in the extreme. Very lovely Beaune, highly recommended. 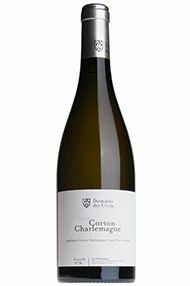 A golden style Corton-Charlemagne from Domaine des Croix with attractive ripe fruit aromas, including traces of banana and coconut. This wine has a delightful freshness behind, followed up with attractive mineralty. 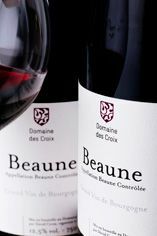 The Beaune appellation can conjure up old-style, sturdy, unforgiving Burgundy of old. In the hands of David Croix and others, it has become a much more desirable appellation. David's 2012 Grèves is always one to look out for; with its tenser, fresher, and more linear components than those beasts of old - give it 6 years min. to show its best. The skins were so thick and tight that it needed nearly four weeks in the fermenting vat. It needed the extra time but is correspondingly backward now. The bouquet has shut down but suggests density. On the palate it is tense, dense and crunchy. The average yield across the domaine this year is 25 hl/ha, well below par, but not the catastrophe which was visited on some, and these 2012s are clearly David’s best wines yet. He found them easy to vinify, though they have required some careful management in barrel because they are so concentrated and compact. The grapes were completely healthy and showed the best analytical balance one could ask for, mostly between 12.5% to 13% alcohol and ideal acidity to preserve freshness. Very deep black purple in colour. 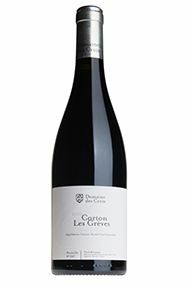 This is a very seductive style of Corton from Domaine des Croix, with real heart to the sumptuous fruit and a lovely long finish. 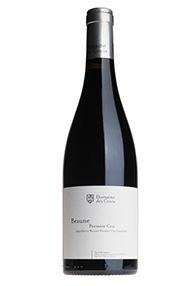 You can really feel the microclimate here, with the position high at the top of the hill on limestone soil adding a refreshing minerality and chalky structure to accompany the bright red cherry fruit. Impressive persistence too. Drink 2022-2029. This has delicious red fruit and almost endless strawberry and juicy cherry flavours- although this is not a massive wine. The 60-year-old vines are planted on shallow topsoil with lots of iron oxide which gives the dense tannic structure. Drink 2023-2033. This is a speical site, at 300 metres’ altitude and on a 20 percent gradient, facing east. The nose has lifted cranberry fruit and a wild edge. The palate has a vibrant energy, lots of rocky limestone tannins and bright, fresh raspberry fruit. A purists’ wine, in the best possible sense. Drink 2022-2028. David is delighted that he finally has a good crop for the first time in many years. Furthermore, he is very pleased with the quality and style of the reds, highlighting their clarity, definition and gourmandise, pointing out that these are airy, red-fruited and pure wines in the same mould as 2000, a vintage which drank well young and still tastes good today. He has extracted an extra level of colour and texture by working the fruit a little harder and carrying out a longer maceration than in the past few years, with impressive results. 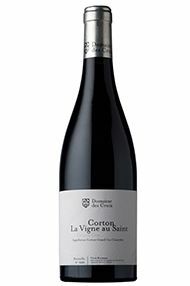 From 60-year-old vines, this is a powerful and complex Corton. The nose is ferrous and spicy, while the palate is rich, concentrated and dense, with a spine-tingling minerality thanks to the hard limestone subsoil. This is somewhat backward now but will evolve into a beautiful wine with time. Drink 2025-2032. Made with 40 percent whole bunches, the nose is intensely fruity and floral, with crushed strawberry and peony notes. The palate has Grand Cru concentration and intensity, with an elegance that covers the underlying steel. Drink 2024-2030. The 25 percent whole-bunch gives a floral touch to the nose. The palate has abundant rich red fruit, real generosity and showy, silky tannins. The inclusion of stems has added a chalky structure that extends the finish and provides complexity. Impressive and quite explosive. Drink 2022-2028. From four separate parcels and with 15 percent wholebunch, this is a very pretty wine, with small red-berry fruit on both the nose and palate. There is a crunchy feel to the fruit, with lovely detail and purity. A wine you cannot help but fall in love with. Drink 2020-2024. David loves the elegance of this vineyard, which comes from a cool site with shallow topsoil and hard limestone subsoil. This is crunchy, pure and focused with plenty of energy. There is a silky, suave mouth-feel but with a rocky undercurrent. Drink 2022-2028.